Newcastle's Salomon Rondon celebrates his goal against Argentina in Madrid. Lionel Messi's return to the Argentina national team ended in defeat - with Newcastle striker Salomon Rondon playing a key part in Venezuela's 3-1 win over La Albiceleste. Rondon opened the scoring in the sixth minute with an excellent finish over Argentine goalkeeper Franco Armani. The game in Madrid was only a friendly but was Messi's first game for his country since the 2018 World Cup defeat by France. Jhon Murillo doubled Venezuela's lead before half-time before Lautaro Martinez pulled a goal back for Argentina. Yet Josef Martinez put the game beyond doubt 15 minutes from time, scoring Venezuela's third from the penalty spot. Elsewhere, Rondon's South American team-mate Miguel Almiron played 90 minutes for Paraguay as his country lost 1-0 to Peru in a friendly. 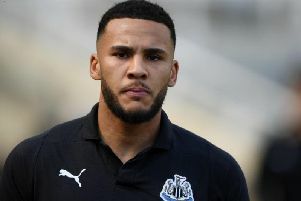 Three other Newcastle players have also been in action this week, with Paul Dummett, Martin Dubravka and DeAndre Yedlin all representing their countries. Dummett played 61 minutes in Wales' 1-0 win over Trinidad and Tobago on Wednesday, while Dubravka kept a clean sheet as Slovakia defeated Hungry 2-0 in their Euro 2020 qualifier. Meanwhile, Yedlin came on for the final 22 minutes as the USA edged past Ecuador 1-0 in a friendly. Christian Atsu and Fabian Schar could also feature for Ghana and Switzerland respectively.